These stunning pool tables are designed and made in the USA and are the ultimate centerpiece, designed to impress. Exclusive to us in the UK, with finance available. Hurricane Billiards tables are among the most unique, unusual and stylish pool and shuffleboard tables available on the market today, and are sold exclusively by Home Leisure Direct in the UK. We are extremely proud to be able to offer these stunning tables, which look amazing and provide professional quality playability. For an unmissable and striking pool or shuffleboard table, Hurricane can't be beaten. Hurricane's range of pool tables is quite unlike anything else you'll ever see. Their mission is to design tables that are not only true pleasures to play, but are also thrilling statements about who you are, what you’ve done and where you’re going. As you can clearly see, their tables reflect a very different design ethos from most manufacturers, with all the personality of true individuals. This focus on creating a new style of table has carved a name for Hurricane as makers of truly "different" pool tables, avoiding the method of "simply changing the colours on the same tired old designs", as they put it. Hurricane simply don't make pool tables like anyone else, and a Hurricane table in your home games room is sure to be a conversation piece for many years to come. Celebrate your individuality with a table that's as unique as you are. Our Hurricane pool tables all come complete with free delivery and installation, and free accessories, so you have almost everything you need to get started once you receive your table. These accessories include a set of Aramith Tournament balls, a rack and chalk, so in no time you'll be enjoying a game of pool on a fantastic new table. Hurricane also make shuffleboard tables, a game that is seeing a resurgence in popularity on both sides of the Atlantic. These shuffleboard tables echo the same individuality as Hurricane's pool tables and are an absolute joy to play on. Be at the forefront of the new wave of shuffleboard players with one of these tables, and add a frankly amazing piece of furniture to your house at the same time. If you're looking for a shuffleboard table that will amaze all who play on it, Hurricane have what you need. While Hurricane offer several pre-designed, customisable tables, they also create one-of-a-kind, highly modified works of art like no other tables in the world. They can take any specification or inspiration and turn it into the pool table of your dreams, or even exceed your dreams. 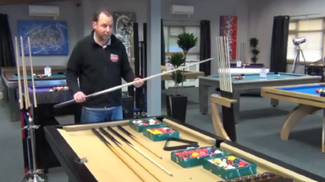 If you would like to know more about this process then please contact one of our sales team on 0800 622 6464 or 01454 413636, and we can talk you through the process of creating a brand new pool table. If you have any questions about any of our Hurricane pool or shuffleboard tables, or any of the other products we sell, please give us a call on 0800 622 6464 and one of our friendly expert advisors will be happy to help you.